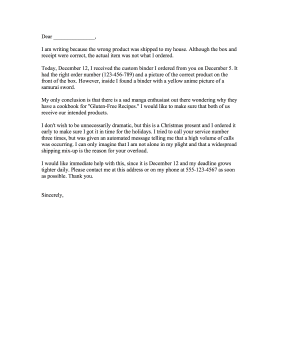 Request the correct item if you receive the wrong product by using this shipment complaint letter. I am writing because the wrong product was shipped to my house. Although the box and receipt were correct, the actual item was not what I ordered. Today, December 12, I received the custom binder I ordered from you on December 5. It had the right order number (123-456-789) and a picture of the correct product on the front of the box. However, inside I found a binder with a yellow anime picture of a samurai sword. My only conclusion is that there is a sad manga enthusiast out there wondering why they have a cookbook for "Gluten-Free Recipes." I would like to make sure that both of us receive our intended products. I don't wish to be unnecessarily dramatic, but this is a Christmas present and I ordered it early to make sure I got it in time for the holidays. I tried to call your service number three times, but was given an automated message telling me that a high volume of calls was occurring. I can only imagine that I am not alone in my plight and that a widespread shipping mix-up is the reason for your overload. I would like immediate help with this, since it is December 12 and my deadline grows tighter daily. Please contact me at this address or on my phone at 555-123-4567 as soon as possible. Thank you.